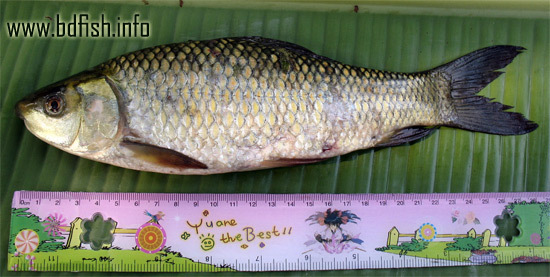 Common names: Rui, Rohit, Rou, Nawla (Bangladesh); Rohu (Fishbase); Indian Major carp, Rohiti, Rau, Riu, Ruee, Rohu, Bhobhari (India). Distribution: Bangladesh, India, Pakistan, Nepal, Myanmar, and Sri Lanka. Morphology: Body compressed and dorsal profile is more convex than that of ventral profile. Single pair of barbel (maxillary) present. Dorsal profile brownish or greenish and silvery on both sides and beneath. Fins are gray in color with orange margin in larger specimen. Lateral line present and complete. Scales moderate. Head 25.9% of standard length (SL) and 21.2% of total length (TL). Body height 29.6% of SL and 24.2% of TL. Eye diameter 17.1% of head length (HL). Maximum length and weight: 90 cm (Hamilton, 1822), 30.5 cm (Bhuiyan, 1964), 80.2 cm (Hussain, 1999), 94 cm (Rahman, 2005). Highest length measured 41.25 cm from Chalan beel (Bangladesh) in 2007. Rahman (1989) recorded 12.5 kg fish from Chandpur (Bangladesh). Habit and habitat: Found in freshwater bodies, rarely in brackish water; some common habitats are- ponds, ditch, canals, beels, floodplains, haors, baors (oxbow lakes), rivers, lake etc. Niche is middle layer of water body. Food and feeding: Takes food from middle layer of habitat. Often from surface layer. Talwar and Jhingran (1991) mentioned this fish as bottom feeder fish. Feed on both natural and supplementary feeds. This fish feed on plant matters including decaying vegetation and also well habituated in taking rice bran, wheat bran, mustard oil cake and other supplementary feed under aquaculture system. Breeding: Naturally breeds in flowing water bodies, especially in rivers, and floodplains during rainy season. Breeding time recorded between July and September from Chalan Beel (Bangladesh). Bhuiyan (1964) reported breeding time of this fish is in the month between July and August and described this fish as a prolific breeder. Artificially breeding (induced breeding) done in hatcheries by using PG (Pituitary Gland) hormone. Harvesting and production: Harvesting is usually done by using rod and line. Large scale harvesting is also done with different types of fishing nets especially seine nets. In Bangladesh, total production was 164,841 kg in year 2003 (FAO, 2004). 5,473 kg from Beels of Bangladesh; 69 kg from Kaptai Lake; 23.33% of total pond production in year 2007-2008 (FRSS, 2009). Bhuiyan, A.L., 1964. Fishes of Dacca, Asiat. Soc. Pakistan, Pub. 1, No. 13, Dacca, pp. 21-22. FRSS (Fisheries Resources Survey System), 2009. Fishery Statistical Yearbook of Bangladesh 2007-2008, Department of Fisheries, Ministry of Fisheries and Livestock, Bangladesh, 25(1): 42 p.
FAO (Food and Agricultural Organization of United Nations), 2004. Fishstat Plus Database software. Fowler, H. W., 1924. Notes and descriptions of Indian fresh-water fishes, Proc. Acad. Nat. Sci. Phila., pp. 67-101. Rahman, A.K.A., 1989. Freshwater Fishes of Bangladesh, 1st edition, Zoological Society of Bangladesh, Department of Zoology, University of Dhaka, Dhaka-1000, pp. 116-117. Talwar, P.K. and A.G. Jhingran, 1991. Inland Fishes of India and Adjacent Countries, Vol. I, Oxford & IBH Publishing Co. Pvt. Ltd. New Delhi-Calcutta, pp. 219-220. Visited 10,849 times, 13 visits today | Have any fisheries relevant question?